Nadine Fattaleh is STAND’s Syria Conflict Coordinator and a student at Columbia University. Looking through a newsfeed for the crisis in Syria would show photos of destruction: the destruction of buildings, infrastructure, relationships, families and lives. But photos of the conflict capture one moment; they show the indescribable cost of war to the people who live in its reality. However, in capturing a single moment, photos take away from the historical context of the war and its broader implications. For example, when seeing a photo of shattered buildings in Damascus, one would seldom stop to contemplate the destruction of a historical oasis of Arab heritage. Under the Ottoman Empire, Damascus attracted flocks of people to the capital of the Levant region to study at its renowned schools, worship in its many sanctuaries and embrace its beautiful architecture. Post-World War I, Damascus remained the birthplace of many renowned artists, writers and musicians. The images of the destructive civil war in Syria show human losses, but not the cost of losing one of the greatest cultural landmarks in the Middle East. As aspects of culture, visual arts, music, and theatre vanish in the outbreak of crisis, a new expression of culture arises in the form of war art. 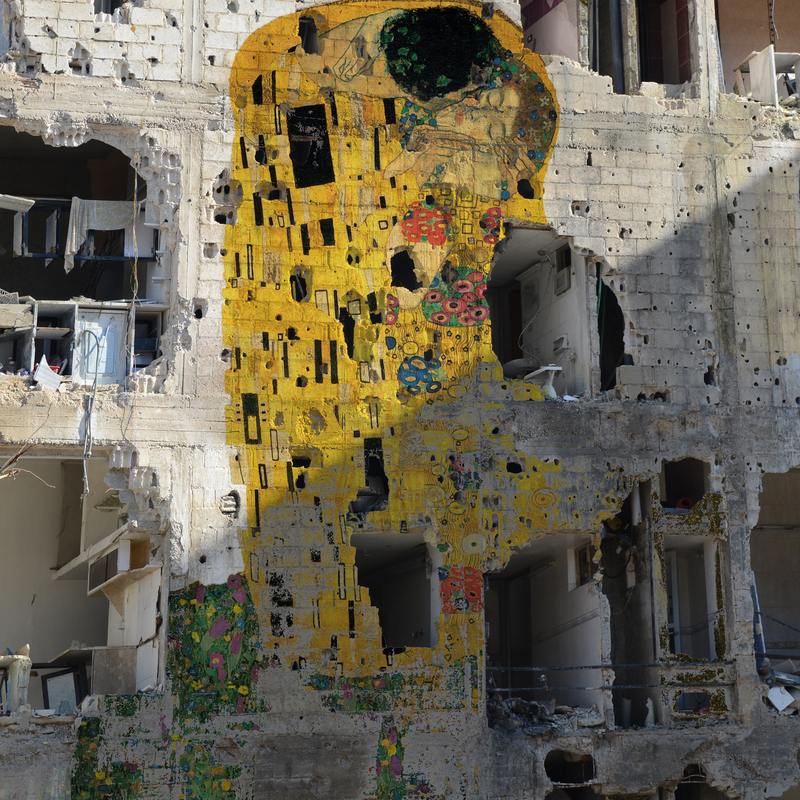 One of the artists that expresses his anguish over the current state of Syria is Tammam Azzam, whose series entitled “Freedom Graffiti,” went viral on social media platforms. Azzam, Tammam. Freedom Graffiti. 2013. Ayyam Gallery Collection. Web. 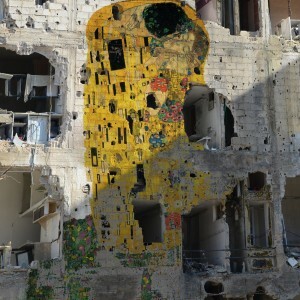 In the most famous piece in the series, Azzam juxtaposes an iconic masterpiece of western art, Gustav Klimt’s ‘The Kiss.’ with the image of a devastated building in downtown Damascus. The blending of the artwork’s pattern with the destruction of the building makes the viewer feel uncomfortable. The series illustrates the dichotomy between the capacity for human innovation and the capacity for destructive action. Azzam’s intention is to make art about the worsening situation in his country and to get people to contemplate the effects of the war, not just its political implications. To me, this is what sets his work apart from many other Syrian artists who have used art as a medium to communicate their ideas. They say a picture is worth a thousand words, but even the pictures of destruction in Syria, particularly in Damascus, don’t suffice to describe the great cultural loss inflicted by the war. Azzam’s work, in an ironic way, reminds the viewer that in addition to the quantifiable losses of human life in war, there are deeper, unquantifiable losses in the devastation of a regional cultural stronghold.